It shouldn't be surprising that long-term Treasurys exhibit almost the same degree of volatility as equities. After all, as we discussed in A Better Way to Think of Cash, Bonds, and Stocks, stocks are essentially high-duration instruments, or perpetuities. The further out on the duration scale you go with bonds, the more likely they will behave like equities, even if they are of the highest quality. 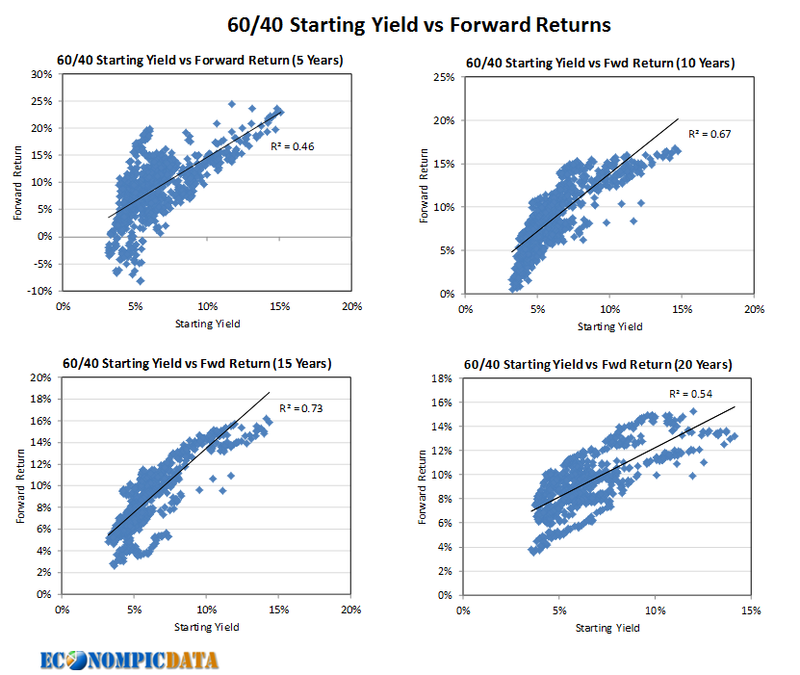 The longer duration means that forward long-term nominal returns of long bonds are much more predictable than those of intermediate-bonds (after all, you are locking in a nominal return over that longer time frame). Similarly, stock valuations tend to be much more predictive over longer time frames than shorter time frames, which are driven more by sentiment. Following Lawrence's lead (and given that few investors invest in long bonds or invest only in stocks or bonds in isolation), I thought it might be of interest to see if we can "calculate" the historical duration of a U.S. 60/40 portfolio and then use this information to try to predict where we are headed. The goal of this is not to scare investors (it may / will), but rather to show that simply investing in a U.S. only balanced portfolio may not cut it going forward. 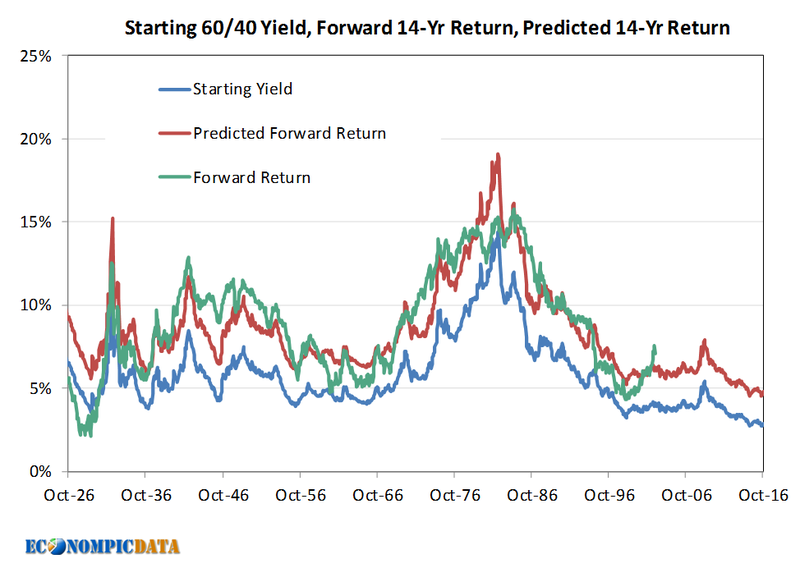 The below chart shows the fit between starting yield and forward returns over times frames from five to twenty years, with the tightest fit being a time frame of 14 years. 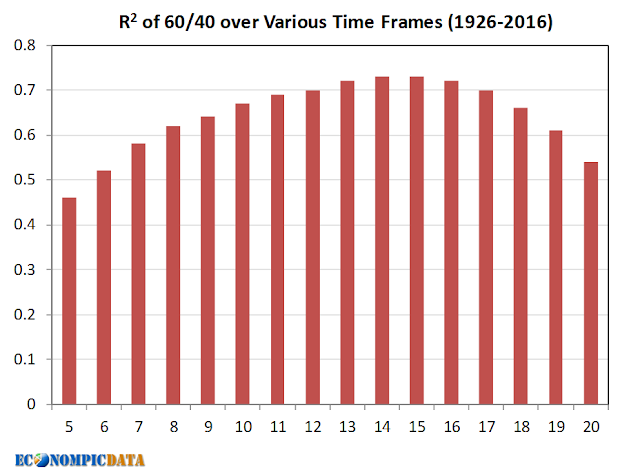 The chart below shows how the analysis looked for a sampling of these times frames. 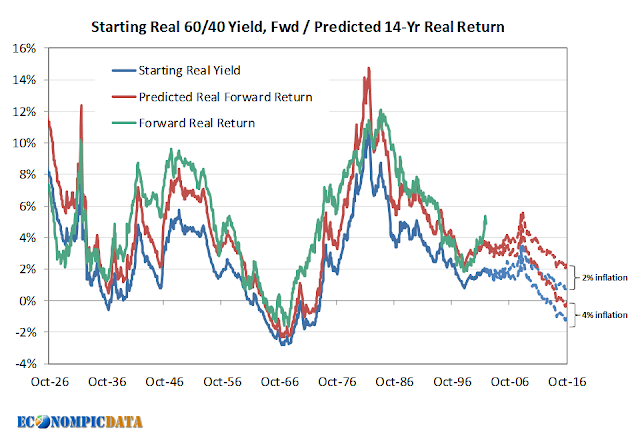 We can see in the following chart that this ex-post calculated formula did a great job at predicting future returns given starting yield. Forward returns were +/- 1.5% of actual annualized returns in 2/3 of all time frames and 80% of all time periods since 1950. My main takeaway is how amazing the fit has been without any knowledge (ex-ante) of a wide range of inflationary and economic environments. 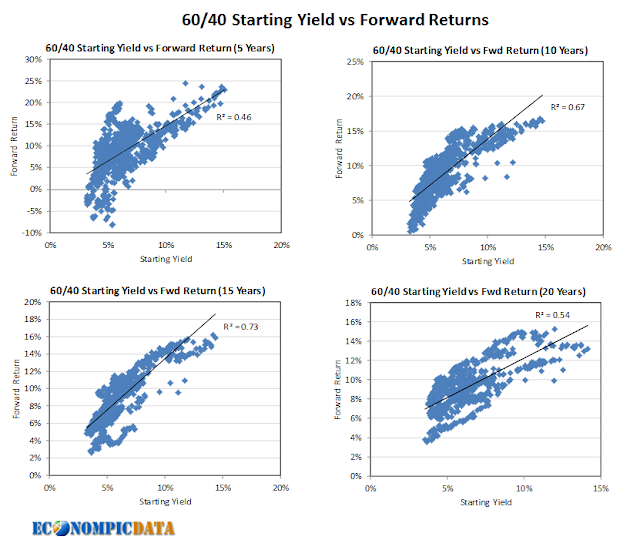 Over any given 14 year window the main driver of performance was the nominal yield of the 60/40 portfolio, while the inflationary / economic environment seemingly only impacted things on the margin (something to keep in mind for those that think a huge economic rebound will solve current valuation issues). In addition, one can see that excluding the very high starting yields of the 1970's / early 1980's (driven by cheap stocks and high interest rates following a period of very high inflation), the nominal starting yield of a 60/40 portfolio was relatively consistent hovering above / below 6-7% in most instances. Unfortunately, the current period appears to be an outlier to the low-end given high multiples for stocks and low yields for bonds, resulting in a starting yield at a 90+ year low. The below chart takes all of the nominal yields / returns in the chart above, but reduces the starting yield and forward returns by the forward 14 year inflation rate (a figure that was known only after the fact). To project future real returns, I show two paths... one assuming 2% inflation and one assuming 4% inflation. You can infer that realized real returns will be worse if inflation moves higher and I have a hard time imagining inflation moving lower in the years to come (I very well may be wrong, but I don't know how our system would handle disinflation given the high levels of nominal debt that would be difficult to pay back without inflation). The result are likely forward real returns for a 60/40 portfolio in the 0-2% range pre-tax with more downside in my view than upside (post-tax - you can take off another 1-2%).